Today's artist spotlight is a crafty little lady living in California named Cristina or @mcareyano! I started following her on instagram awhile back, and fell in love with her vintage themed feed! Then she started posting photographs of brightly colored wreaths and I needed to know how I could get my hands on one of these babies. I recently purchased one from her as a gift to my sister-in-law on her wedding day. Cristina has such a unique thing going, and she is so personable and works with you from start to finish with your order! She is a great communicator and it has been such a pleasure working with her. 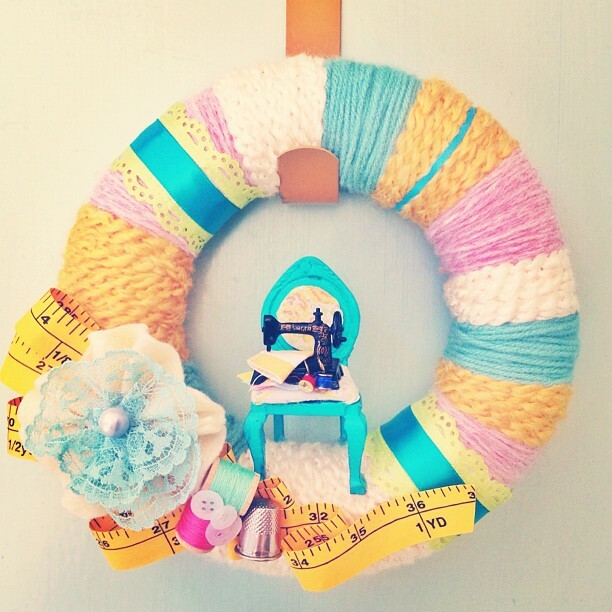 Im so addicted to these wreaths, and I see many more purchases in the future. Why did you start making wreaths? I started making wreaths about 3 years ago. The first yarn wreath I made was two years ago. I made it as decor for the apartment that my honey and I moved into. I usually start with the figurine, since they are the centerpiece of the wreath. When I find one I like, I choose yarn, felt and other objects I feel would look best. It is totally organic and sometimes I start with a idea that changes into something else. 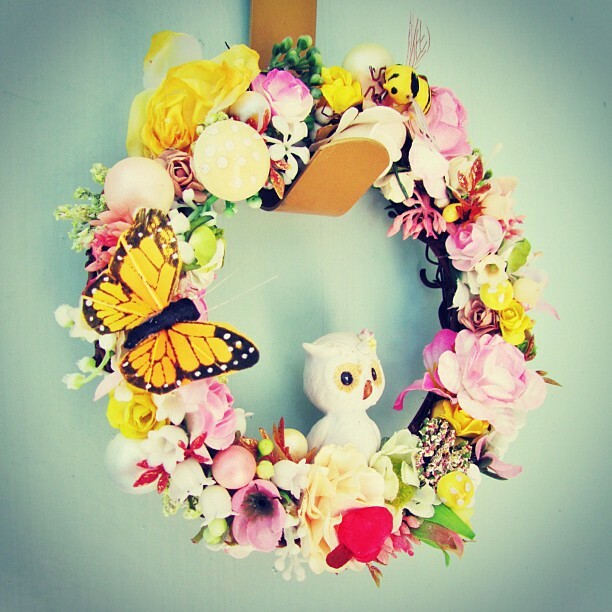 I have a few wreaths that I have specific plans for like my Alice in Wonderland Wreath. The process for the planned wreaths take a little longer because they are so specific. How do you come up with the themes for your wreaths? I usually let the little guy or gal tell me what they want. Sometimes they want to be a French skunk. Other times they want to be a tribute to the 80's. It is all about the figurine. They determine the theme. 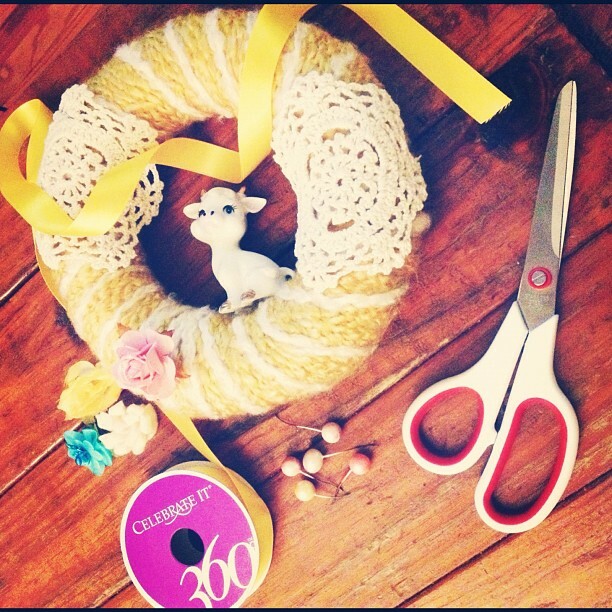 Which wreath has been your favorite project? The wreath that I love the most is Mustard and Moo. When I found that little calf I fell in love. 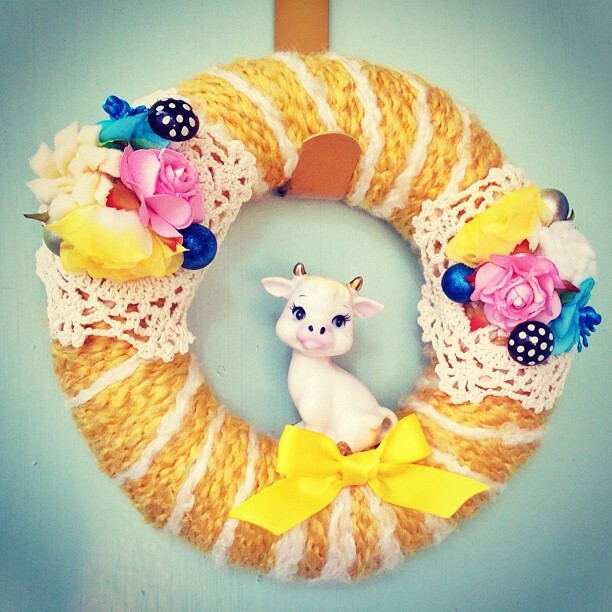 I instantly thought of butter and that is why I placed her on a wreath wrapped with mustard yarn. I am also very excited about the wreath necklaces I've been working on lately. This is the wreath I purchased for my sister-in-law! She was so perfect for the occasion! This is my recent favorite, i love the theme, and the colors are fantastic! Mustard and Moo, Cristina's favorite! If you are interested in purchasing a wreath from Cristina, email her at mcareyano@gmail.com! 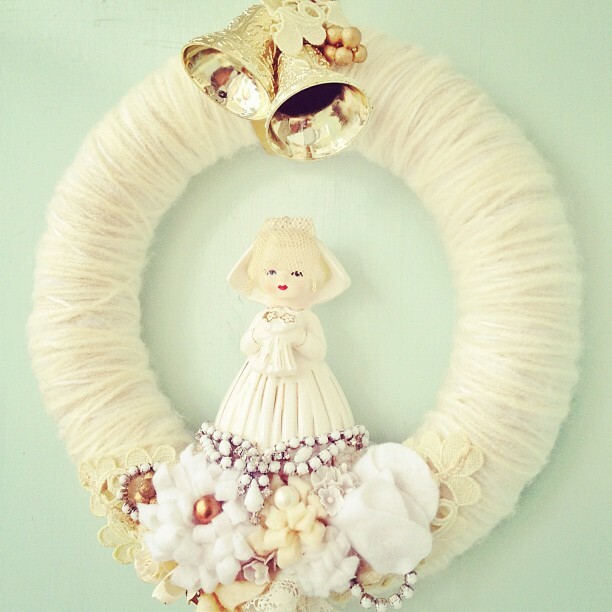 To view her current stock of wreaths follow her on instagram, click here!